Audio engine for old PalmOS devices. 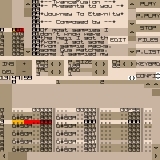 Spectrum 48K Emulator for PalmOS5. User friendly interface, sound, variable emulation speed and SNA/TAP files support. PsyTexx is the first Amiga MOD-based player and tracker for PalmOS. It has powerful 16-channel pattern editor with some additional (non-standard) effects. PsyTexx II is the cross-platform music tracker based on the XM (FastTracker eXtended Module) format. Supported systems: Windows, Linux (X11 and text console) and PalmOS. Experimental version of the USB card reader. It contains two parts: PalmCard (server part for Palm) and cardreader (client part for Linux). Source code is included. Very simple graphics editor for drawing directly on the screen of your Palm-launcher. Press any button for menu. Not compatible with the latest PalmOS5 devices. Works with T|T, but not with Zire and others. Simple JPEG Viewer for your Palm.